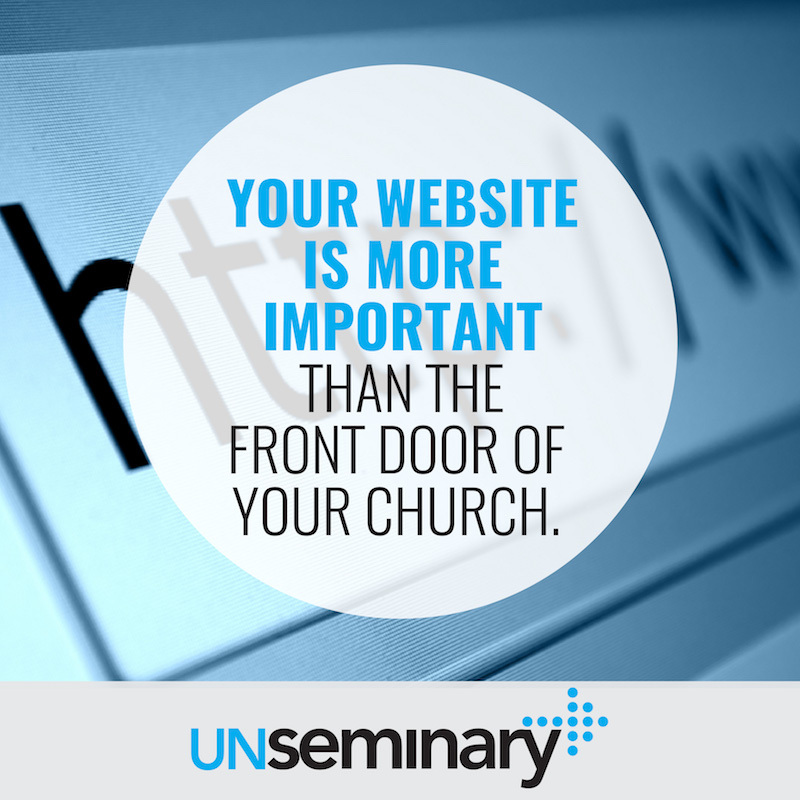 Is your church’s website keeping up with changing online trends? How do you ensure that your internet presence is seen by the maximum number of people? We live in a “mobile first” world where the majority of people who view your site will do it from their phones or tablets, not from a laptop or desktop computer. In fact, mobile usage of the web overtook desktop usage in 2010 — this is not a new trend! [ref] Your website needs to be mobile enabled to ensure you reach people who want to connect with your church. If it’s not mobile ready, you will miss out on people who could be impacted by your ministry. Google is the online trendsetter for “findability.” When people look for your church online, there is a strong possibility they will start with the search giant. Nearly three-quarters of all search engine traffic in the world is generated from Google. [ref] Look closely at the search engine source traffic on your website and it’s probably much higher than that. Google recently declared that mobile-friendly sites will receive a boost in search rankings. [ref] Google keeps the majority of their search algorithm behind a secretive wall. For them to declare that mobility is getting a boost is something every church leader with a website needs to pay attention to. 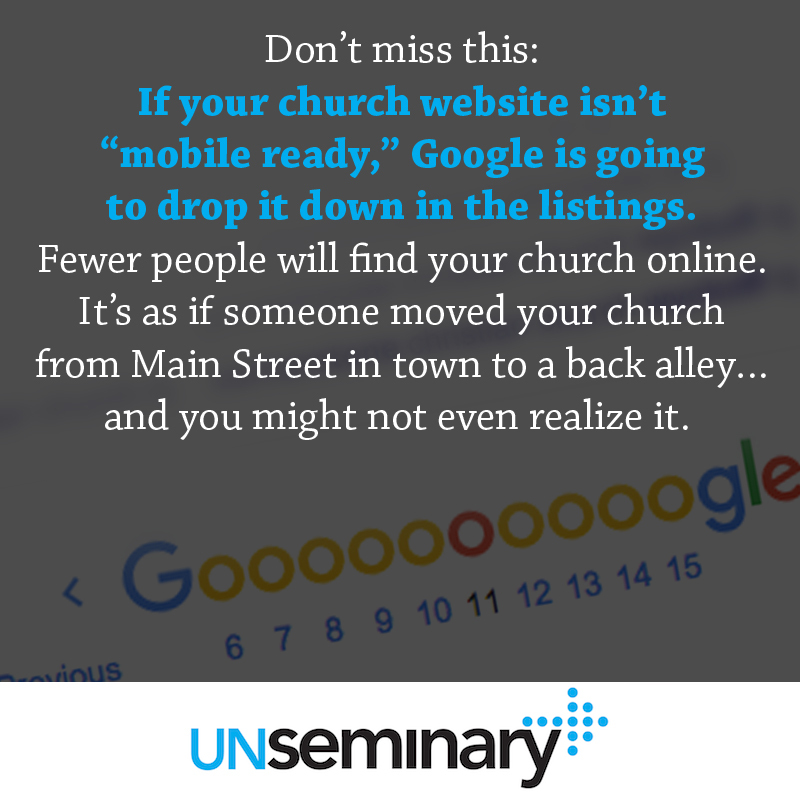 Don’t miss this: If your church website isn’t mobile friendly, Google is going to drop it down in the listings. Fewer people will find your church online. It’s as if someone moved your church from Main Street in town to a back alley … and you might not even realize it. 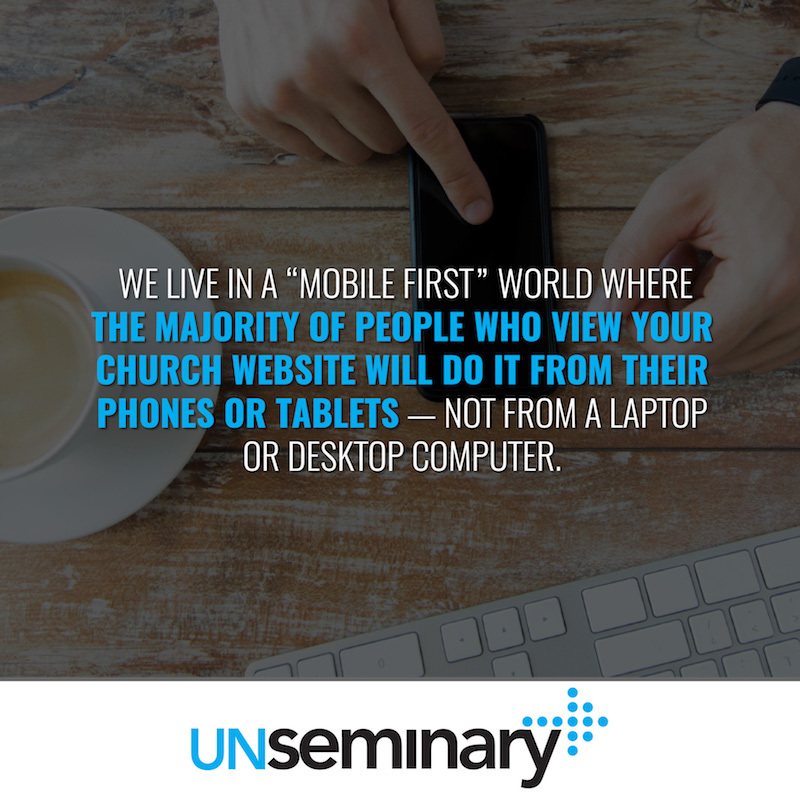 When unSeminary heard about this important shift, we tested a number of leading churches’ sites to see how mobile friendly they were. We picked 15 influential churches and were shocked at the results! Four of the largest and most influential churches in the country failed the test. These churches all have large communications infrastructures so we were astounded that such a high percentage of these churches failed. As we continued to poke around the web, we found more churches that failed the test. unSeminary is sounding the alarm to our friends in church leadership. The good people at Google have made it very simple to figure out if your website is mobile friendly. They’ve created an easy-to-use online tool in which you enter your website address. It will tell you if your site passed or failed. If your website fails, it will also tell you why so you can address the issues. Use the Google Mobile-Friendly Test right now to find out if your website passes or fails. Don’t miss how straightforward Google has made this. Clearly, they have invested time, effort and energy in order to communicate the importance of mobile-friendly websites. They are indicating strongly that this is the future of the web. It needs to be the future of your internet strategy too. Google wants more people happily using the internet to help drive their business model so they are rewarding sites that are most likely to please people. Take a deep breath // This is a declared direction from Google but it’s not like your church’s website will disappear overnight. Plan a course of action and move to fix it but don’t panic. Consider a platform change // As we looked at a number of “failed” sites, it seemed like they were on older content management systems. This software runs on a server and makes the site work. It might be time to upgrade to something more “modern.” I’m a huge WordPress fan (we’re moving our site to it as we speak) but you could also consider a proprietary solution. Set a deadline and then iterate // Updating a church website can be a huge project. The last two of these I’ve done at our church have taken a year to complete. You probably need to move faster than that in this case. Rather than attempting to revise the entire website, figure out how you can do it over a few months. Move the most important parts of the site first and then phase in the rest with regular releases over time. Hire a firm to help // Your best option might be to contact someone to help build your next site. The advantage of working with a professional that deals with this all day long is they will take the time to understand what you want and ensure it’s done right. We highly recommend you connect with Dawn Nicole Baldwin at AspireOne. In fact, she set up a handy tool for booking a free consultation call just for our readers … click here to book now. Understanding The Full Impact Of Web Design On SEO, Branding, And More // This is a great overview article that will give you a grounding in some of the basics. Statistics on consumer mobile usage and adoption to inform your mobile marketing strategy mobile site design and app development // Here’s a treasure trove of data on shifting consumer behaviors and preferences. Be warned that you might get lost in all the charts on this site! Google’s mobile-friendly algorithm boost has rolled out // This article is from a site called SearchEngineLand, which reports exclusively on issues related to search. Think of it as The New York Times of search engine information. 63 Of The Best Church Websites In 2015 // Check out this great source of inspiration if you’re considering a redesign. Why Your Church Should Use WordPress Multisite // This article makes a solid case for why this open source (FREE) content management system should be the base of your web strategy. Note: Google’s test was run on May 18, 2016. The results might change as these churches update their websites. The PDFs show the results at the time of the test. In my limited experience, I’ve found church websites, even influential ones to not necessarily always keep up with the current state of development for websites and internet. I went to 7 larger churches one Easter week, and only 2 had text-in giving for donations, for example. We’ve got a ways to go..
A great ‘heads up’ Rich! Not only churches should take note… bloggers or businesses should run the test. Thanks for this Rich! Mobile friendly sites are hugely important in today’s day and age. I do most of my own internet browsing from my mobile when I’m not at work. Another reason why people may want to switch to a more modern CMS like WordPress is that there can be huge cost savings involved in switching. My church started using a solution over 10 years ago, which worked well for them at the time, but now it’s an expensive solution that hasn’t kept up with the times. We are switching to WordPress and have recently launched a ChMS system – our WordPress site and ChMS system combined will cost much less than just the CMS system we’ve been using. So true! Lots of churches are paying high fees to have access to content management system that isn’t keeping up with current standards! Which ChMS will you be using? And Rich, which would you say is the most cost-effective and usable? This is super-helpful. Thanks for what you guys do!